The galaxy was uncovered in radio emission travelling to Earth using CSIRO’s Australian SKA Pathfinder telescope (ASKAP), located at the Murchison Radio-astronomy Observatory (MRO). The team used a special technique to detect a change in radio waves coming from within the bright centre of the galaxy PKS B1740-517, located near the Ara constellation. The five-billion-year-old radio emission was stamped with the ‘imprint’ of hydrogen gas it had travelled through on its way to Earth. The gas absorbs some of the emission, creating a tiny dip in the signal. “At many observatories, this dip would have been hidden by background radio noise, but our site is so radio quiet it stood out clearly,” Dr Allison said. A ring of dust 200 light years across and a loop covering a third of the sky: two of the results in a new map from the Planck satellite. Dr Mike Peel and Dr Paddy Leahy of the Jodrell Bank Centre for Astrophysics (JCBA) presented the images today at the National Astronomy Meeting (NAM 2015) at Venue Cymru, Llandudno, Wales. The European Space Agency (ESA) Planck satellite, launched in 2009 to study the ancient light of the Big Bang, has also given us maps of our own Galaxy, the Milky Way, in microwaves (radiation at cm- to mm-wavelengths). 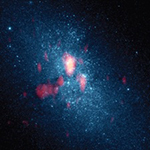 Microwaves are generated by electrons spiralling in the Galaxy’s magnetic field at nearly the speed of light (the synchrotron process); by collisions in interstellar plasma, by thermal vibration of interstellar dust grains, and by “anomalous” microwave emission (AME), which may be from spinning dust grains. The relative strength of these processes changes with wavelength, and are separated using multi-wavelength measurements from Planck, from NASA’s WMAP satellite, and from ground-based radio telescopes, giving maps of each component. When night falls on Rosetta’s comet 67P/Churyumov-Gerasimenko, the bizarrely shaped body remains active. This can be seen in new images of the Ma’at region located on the comet’s “head” captured by OSIRIS, the scientific imaging system on board the Rosetta spacecraft. They were taken approximately half an hour after the Sun had set over the region and show clearly distinguishable jets of dust escaping into space. Researchers from the OSIRIS team believe that the increasing heating-up of the comet is responsible for the newly observed phenomenon. “Only recently have we begun to observe dust jets persisting even after sunset”, says OSIRIS Principal Investigator Holger Sierks from the Max Planck Institute for Solar System Research (MPS) in Germany. In the past months, the comet’s activity originated from illuminated areas on the day side. As soon as the Sun set, these jets subsided and did not re-awake until after the next sunrise. An exception poses an image from 12 March, 2015 showing the onset of a dust jet on the brink of dawn. 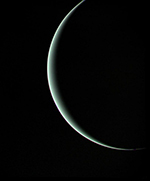 Observers in eastern Australia, all of New Zealand, and parts of the South Pacific will see the planet Uranus pass behind the waning crescent Moon in the early morning of June 12, 2015. The precise timing of the event depends on your location. In Adelaide, Australia, Uranus passes behind the Moon at 18:49 UT, just after moonrise, and emerges from the dark part of the crescent Moon’s face at 19:57 UT. In Sydney the occultation begins at 19:01 UT and ends at 20:17 UT. Observers in the rest of the world will see Uranus close to the crescent Moon in the eastern pre-dawn sky. This presents an excellent opportunity to spot this distant ice giant with a pair of binoculars or a small telescope. Slooh will be presenting live views of the event courtesy of our Australian feed partners. Join us to watch live views of the Solar System in motion! Sharp images obtained by the Hubble Space Telescope confirm that three supernovae discovered several years ago exploded in the dark emptiness of intergalactic space, having been flung from their home galaxies millions or billions of years earlier. Most supernovae are found inside galaxies containing hundreds of billions of stars, one of which might explode per century per galaxy. These lonely supernovae, however, were found between galaxies in three large clusters of several thousand galaxies each. The stars’ nearest neighbors were probably 300 light years away, nearly 100 times farther than our sun’s nearest stellar neighbor, Proxima Centauri, 4.24 light years distant. uch rare solitary supernovae provide an important clue to what exists in the vast empty spaces between galaxies, and can help astronomers understand how galaxy clusters formed and evolved throughout the history of the universe.